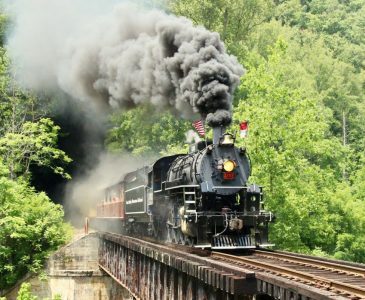 Two scenic railway excursions run from Bryson City through the beautiful countryside of Western North Carolina, providing a day trip for all the family to enjoy. Select from one of two excursions from March to December. The Tuckasegee River excursion runs on Saturdays only in Jan & Feb.
Nantahala Gorge is a 4.5-hour round trip into the Nantahala Gorge. It stops at the Nantahala Outdoor Center and returns via the same route. The adventurous may wish to “Raft & Rail”, enjoying a fully guided raft trip back along the Nantahala River (8 miles) to Bryson City. Tuckasegee River is a 4-hour, 32-mile round trip along the Tuckasegee River to Dillsboro, where you can enjoy restaurants and shops during the layover. Highlights of this trip include the man-made Cowee Tunnel and partial movie set where the Fugitive was filmed (starring Harrison Ford). There are a variety of train options (steam or diesel) and special event trains. Dine in First Class Cars with a private attendant and breathtaking views or ride in an Open Air Gondola. Directions from Buttercup Haven to Bryson City (1-hour drive). Visit the Great Smoky Mountains website to learn more and book your tickets.